Less-lethal weapons are tools and techniques designed for riot control and other security functions with the intention of neutralizing hostile activity without killing or causing permanent bodily harm. Varieties of less-lethal weapons technology range from batons and beanbag rounds (non-lethal bullets fired from an ordinary or modified rifle or shotgun) to electric Tasers, pepper spray and tear gas, and equipment that emits loud noises, bright lights, or even bad smells. Supporters of less-lethal weapons technology maintain that it constitutes a humane means of controlling disturbances, but detractors hold that these weapons are more harmful than authorities claim. The array of technologies under the heading of "less-lethal weapons" is vast. As early as 1972, a report by the U.S. National Science Foundation identified no less than 34 varieties of less-lethal weapons technology then in the research or developmental stages. Among these were electrified water jets; stroboscopic light and pulsed sound weapons; infrasound weapons which would use low-frequency noises inaudible to the human ear; guns for firing drug-filled rounds; "stench darts," which would emit a powerful and unpleasant smell; and a device called an "instant banana peel," designed to make pavement slippery. A later weapon in development at the beginning of the twenty-first century used sticky foam which, when fired at an attacker, made it impossible for the attacker to move. Among the most well known of devices is the M26 Advanced Taser, which can be used to neutralize an individual by means of electric shock. Similarly, electronic riot shields and electroshock batons also use voltage to neutralize attackers. Manufactured since the mid-1980s, electrified riot shields make use of special plates fitted with metal strips. In the handle of the shield is a button which, when pushed, can send as much as 100,000 volts—twice the capacity of an ordinary Taser—through the metal, an act accompanied by the emission of loud noises and bright sparks. Numerous varieties of less-lethal devices are fired from an ordinary rifle or shotgun, or one that has been modified for that purpose. This technology originated with British colonial forces in Hong Kong, who used wooden rounds. Varieties of less-lethal ammunition include baton rounds or plastic bullets; wooden bullets; rubber balls; and nylon bags filled with lead pellets known as "beanbag" rounds. Sounds, smells, and light. Numerous varieties of less lethal weapons technology make use of sounds, smells, or light. The basic idea behind such techniques is not new; biblical texts report that prior to attacking the city of Jericho, the Israelites marched around it seven times, shouting and smashing cymbals to intimidate the inhabitants. In World War II, the U.S. Office of Strategic Services (OSS) issued to its operatives in Asia a "psychological harassing agent" called "Who, Me?" According to an OSS manual, the gas "is to be squirted directly upon the body or clothing of a person a few feet away. The odor is that of Occidental feces, which is extremely offensive…"
In the late twentieth century, a British government research project was tasked with developing means of using noxious odors for crowd control in Northern Ireland. Among the items in development, according to a Financial Times report, were chemical compounds intended to produce "transient symptoms of nausea and gagging." The principal is not different from that of tear gas and pepper spray (itself a variety of tear or CS gas), chemicals long used to quell riots or neutralize attackers. Researchers at U.S. national laboratories are also reportedly in the process of developing various means for using sound and light as weapons. For example, ultra-sound generators, as well as microwave and acoustic disabling systems, may be used to disturb the inner ear, throwing an individual off balance. Another item of future technology is a radiator shell that would use superheated gaseous plasma, or ionized gas, to produce bursts of light. In discussing less-lethal weapons technology, there is little middle ground. On the one hand, law enforcement agencies and supporters present these materials and techniques as humane alternatives to more violent means of crowd control. On the other hand, opponents view them as methods by which a police state can potentially exert greater power over its subjects. The antipathy toward less-lethal weapons technology by environmental, socialist, and anarchist groups is not surprising, given the fact that protesters associated with these movements have most often been the target of less-lethal weapons. They have been used, for instance, to quell anti-globalization demonstrations in recent years, as well as antiwar protests in the United States during the 2003 war in Iraq. 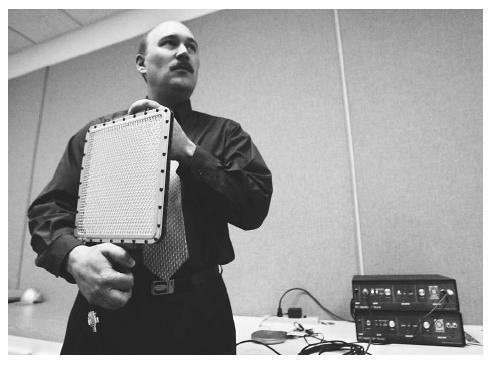 An executive with American Technology Corporation displays a type of sound-gun device that can beam sound to a person so that it appears to be coming from a wall or other inanimate object. Soldiers may someday have similar non-lethal weapons in their arsenals. effectiveness, rather than to questions of whether they meet designers' putative aim of providing more humane control systems. A 2002 Law & Order review of less-lethal weapons did, however, note that "while they do greatly reduce the risk that a subject will be killed, the risk is still unfortunately present." For this reason, the National Tactical Officers Association had undertaken a study to assess the causes of deaths from less lethal weapons, and to develop means of reducing the dangers. "In the interim," the report noted, "one of the best things that departments can do is [to] restrict the use of these projectiles to the upper end of the force spectrum." Eaglesham, Jean. "'Bad Smells' Could Be Used to Disperse Crowds." Financial Times. (October 31, 2002): 3. "IACP's Less Lethal Force Options Course." Law & Order 49, no. 9 (September 2001): 95–99. Oldham, Scott. "Less-Lethal Munitions." Law & Order 50, no. 2 (September 2002): 54–56. Rappert, Brian. "Assessing Technologies of Political Control." Journal of Peace Research 36, no. 6 (November 1999): 741–750. Rosenbarger, Matt. "Less-Lethal Improvements: Federal and ALS Work Together." Law & Order 49, no. 11 (November 2001): 84–86. An Appraisal of Technologies of Political Control. < http://cryptome.org/stoa-atpc.htm > (April 15, 2003).